These are the barn doors for the 60,62 Series. if you want to change from hatch to barn doors this is you're first step. 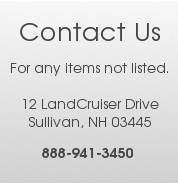 Please contact us by phone to get the rest of the parts you may need.